This is the last past of the series in hand embroidery on wearable. 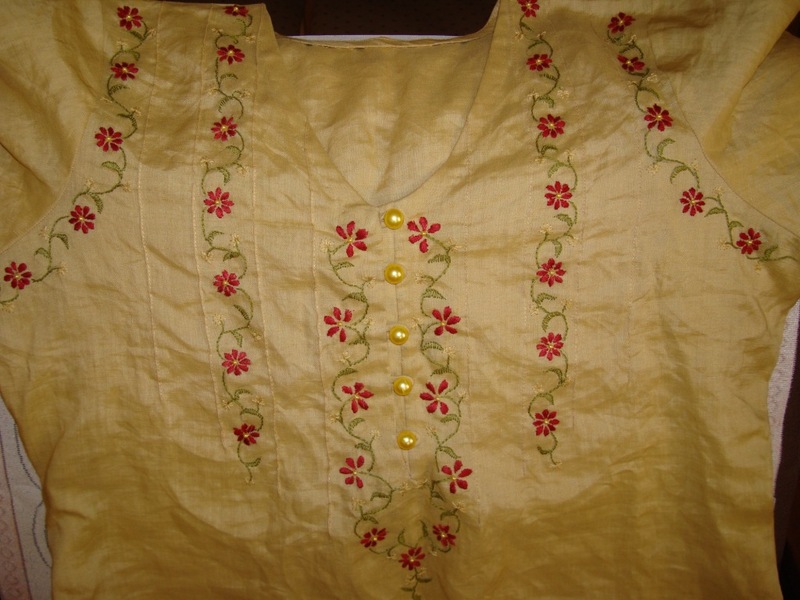 In this post we’ll consider some ideas of designing embroidery on tunics which are marked for necklines and sleeves. 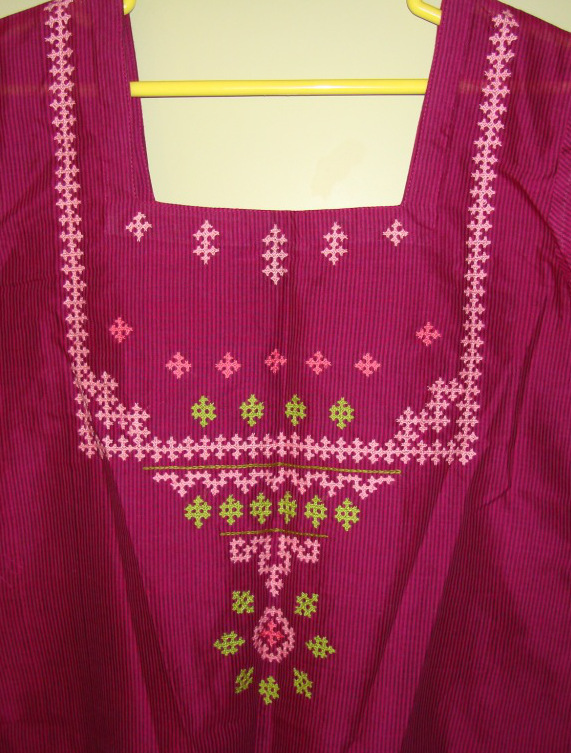 By this method it is possible to work any type of embroidery of our choice on wearable. 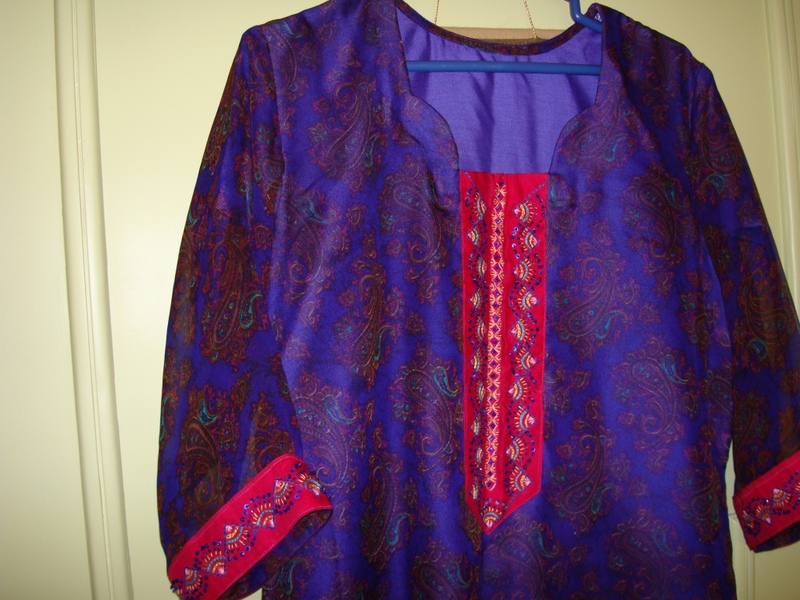 Ready to wear tunics are made this way on large scale. The fabrics are marked for necklines, sleeves, slits, shoulders, borders. The chosen embroidery designs are transferred on to the fabrics. 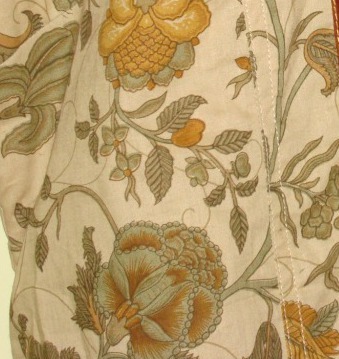 These fabrics are secured on big rectangular embroidery frames. 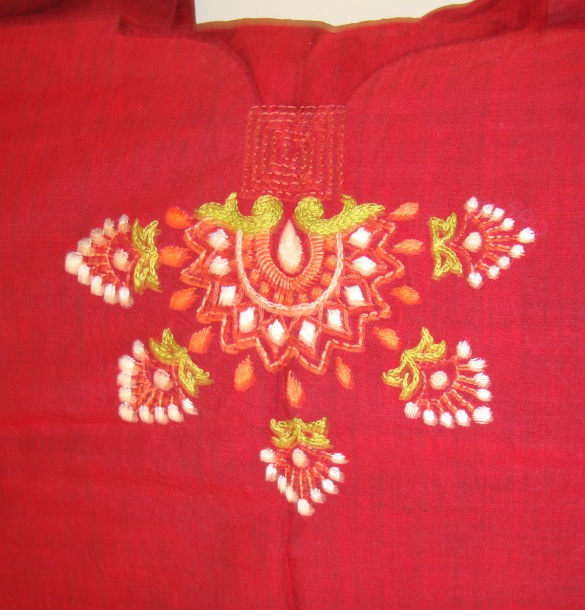 The embroidery is done by embroiderers trained for this. 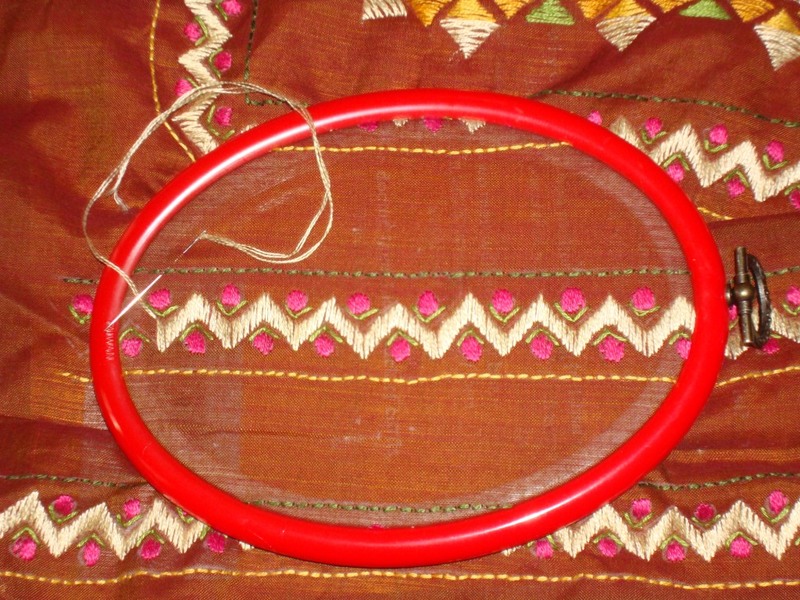 After the embroidery is completed, the fabrics are taken away from the frames and sewn by tailors. But we can do it on a small scale. After choosing the embroidery design, we can ask the tailor [or if a person is good tailor, then help themselves] to mark the places on the fabric to work the embroidery. Using these markings as guidelines, we can transfer the pattern on the fabrics. 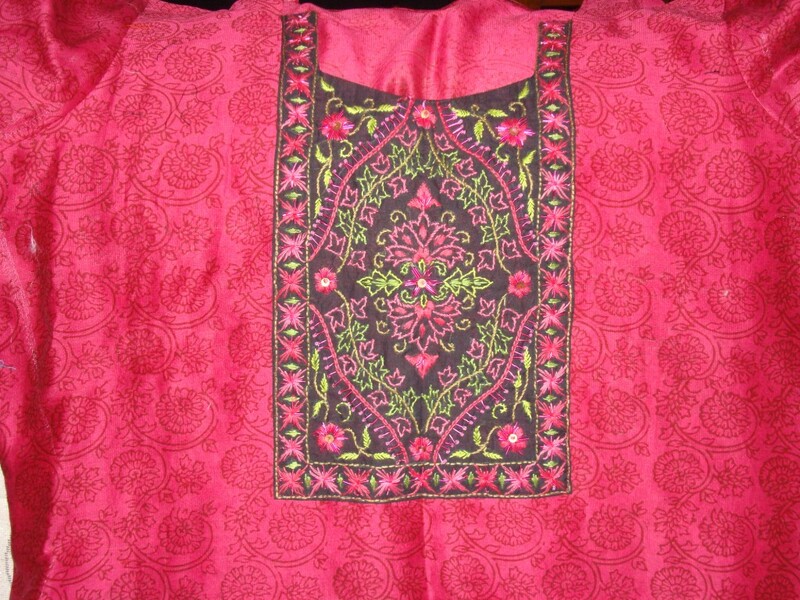 After completing the embroidery, the fabrics can be sewn into tunics, blouses, shirts… as the case may be. 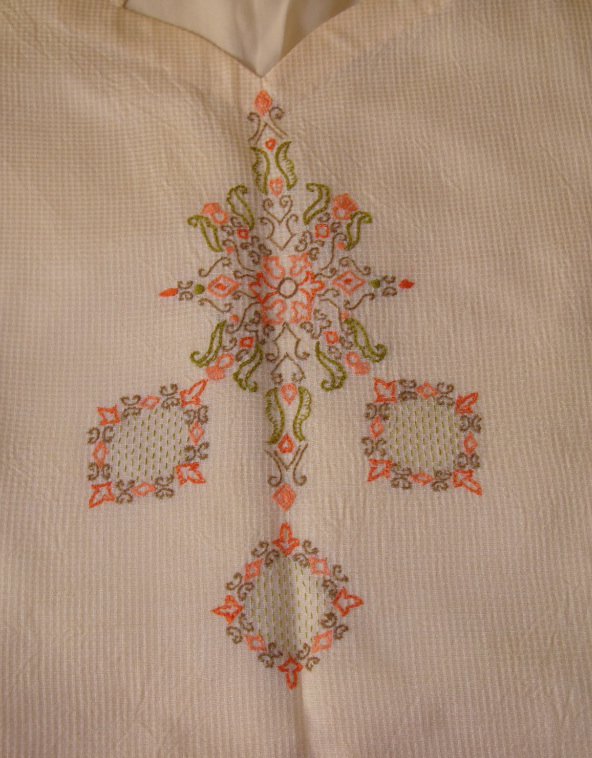 Here are few samples of embroidered tunics, which were marked, embroidered and sewn into tunics. 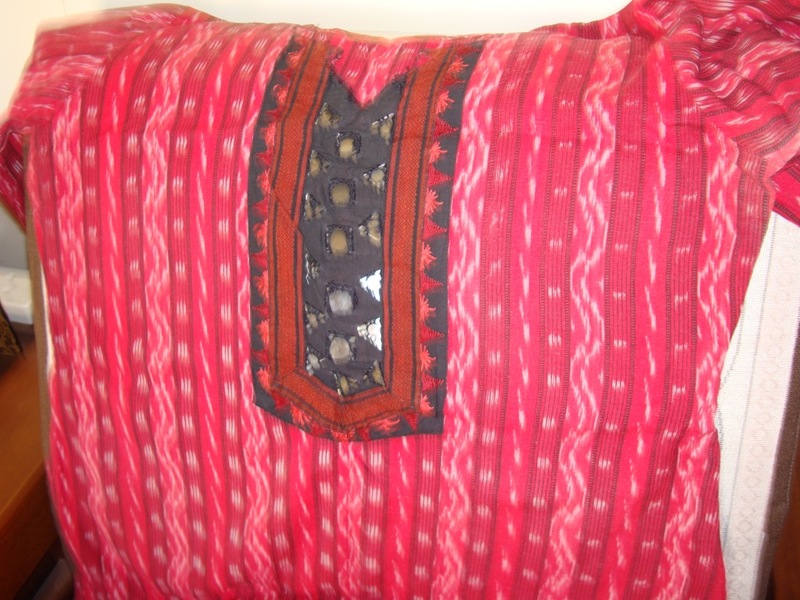 This mangalagiri cotton tunic with stripes was marked with neckline. This was in early days when I was trying this idea. 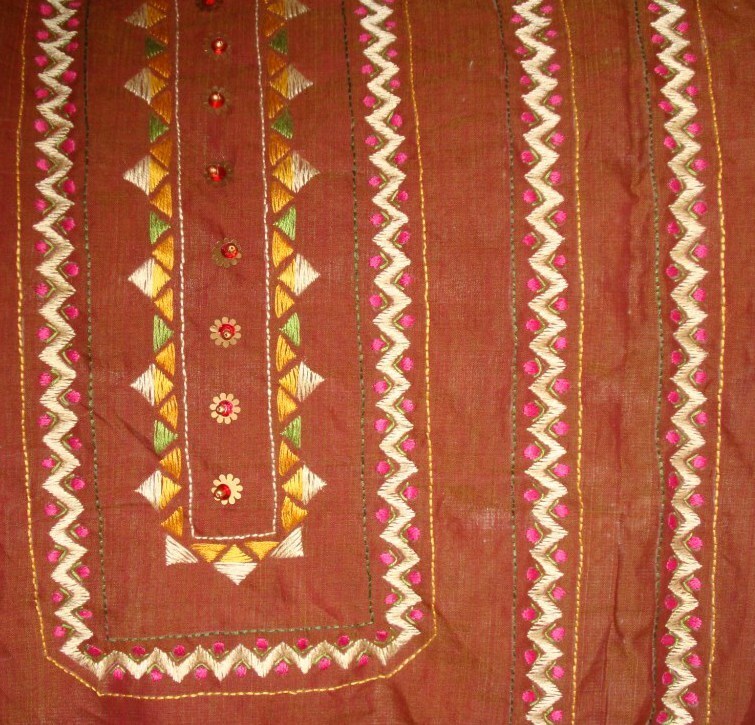 Though it was marked, the pattern chosen for this kutchwork embroidery was set apart from the actual neck line. 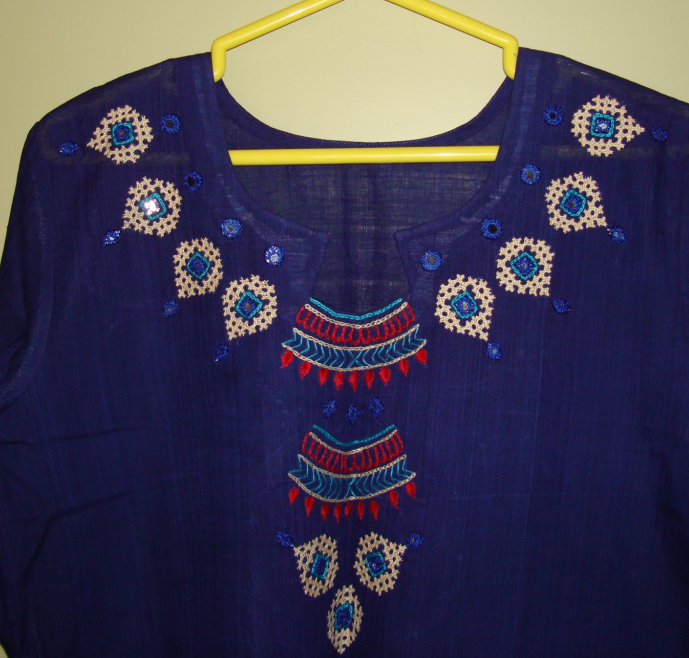 After embroidering on the pattern, I added some small kutchwork motifs below the neck. 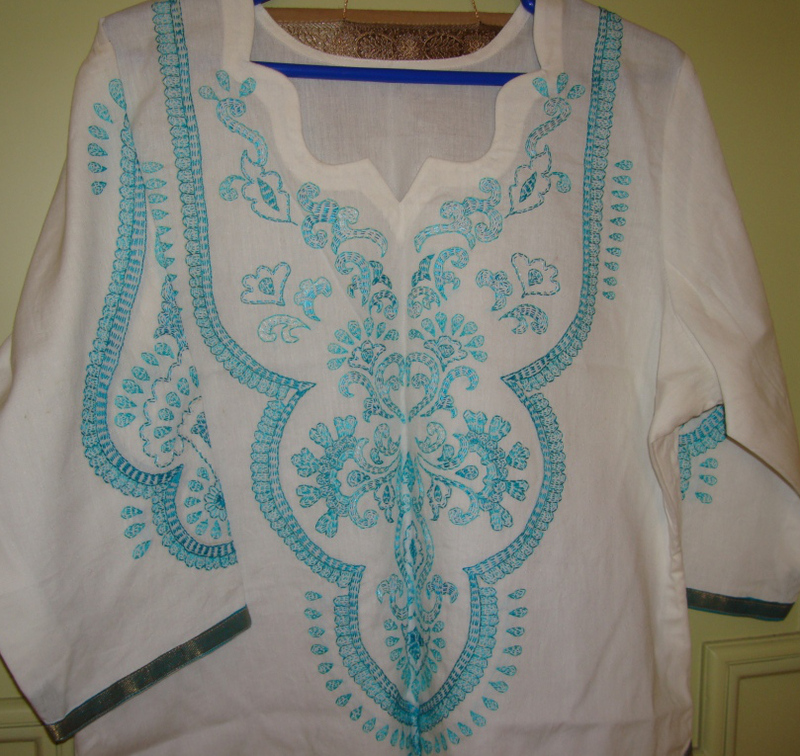 The shirt fabric is linen and the idea was to work white work on this. The markings were made according to the pattern, which was to be worked on both sides in the front. Crochet edging was worked later on the sleeve. This embroidery was a tough project, linen fabric did not help. 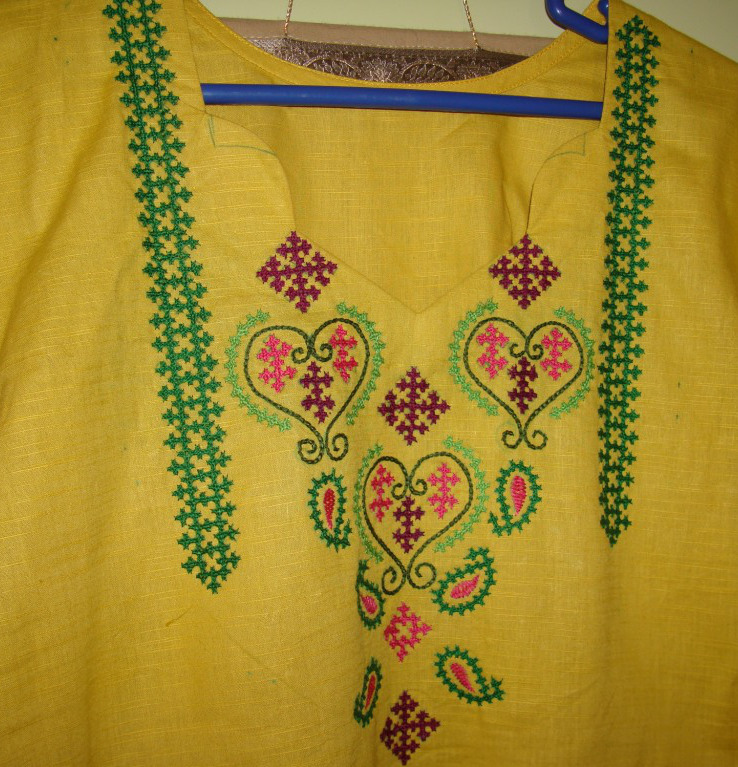 This yellow tunic is cotton. 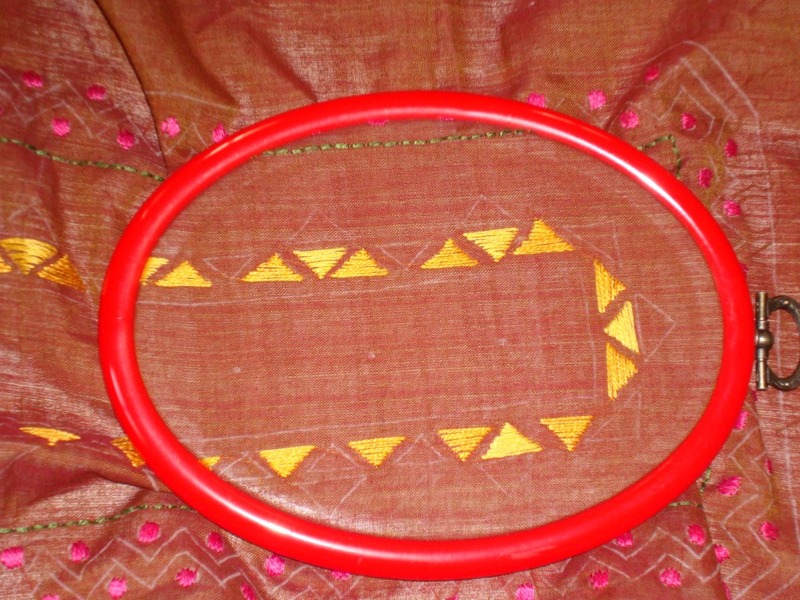 The pattern was transferred on to the front, where a marking was made for the neck. White and yellow carbons were ruled out on this colour. Green carbon paper was used to transfer the pattern. The marking is still on the neck to show the difference between the neck line on pattern and the actual neckline! 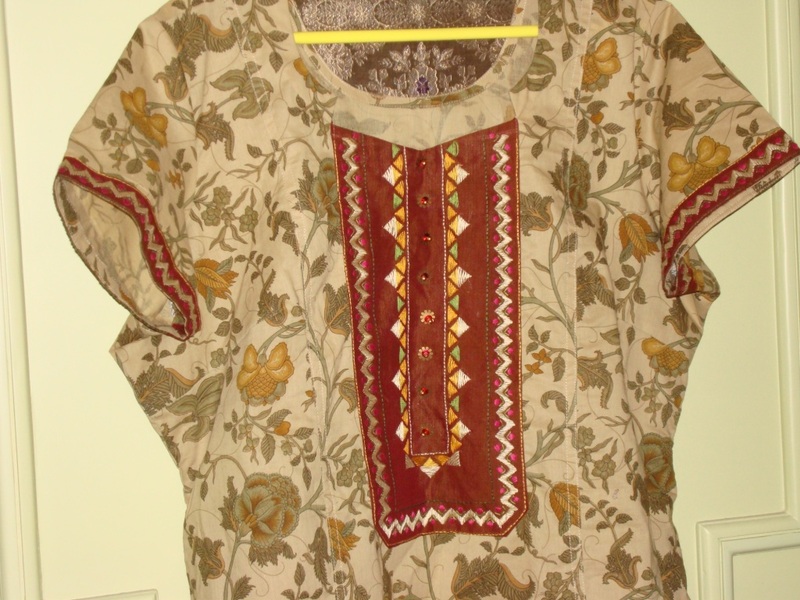 This mangalagiri cotton tunic has kantha embroidery on it. The tailor had marked a simple round neck. 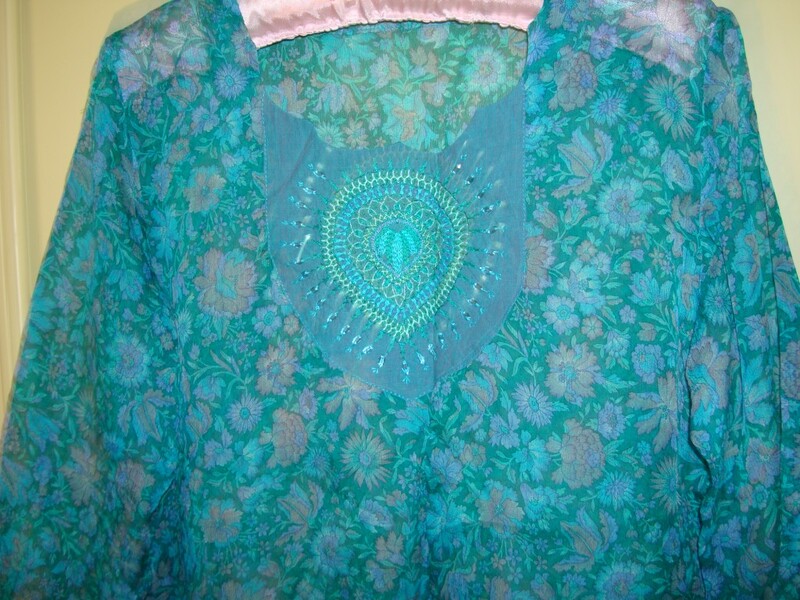 The pattern transfer and embroidery were worked on front and sleeves based on that. 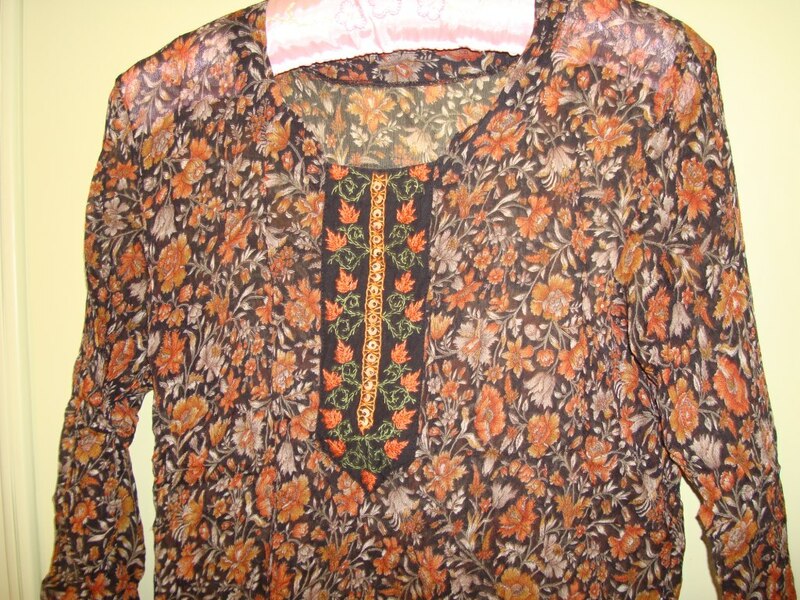 Seeing the work, he changed the neckline to this beautiful one. Sometimes it is better to leave some small space around the neck, to facilitate these kind of surprises. 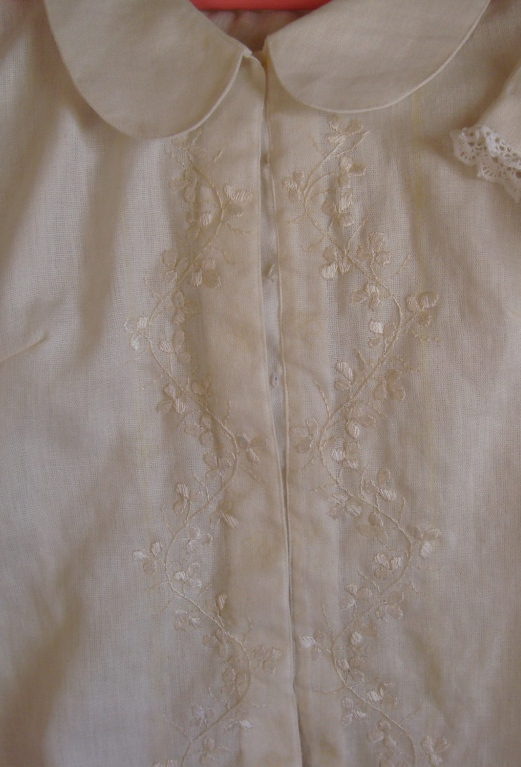 There is also a possibility of the tailor cutting off a small part of embroidery during his course of work. 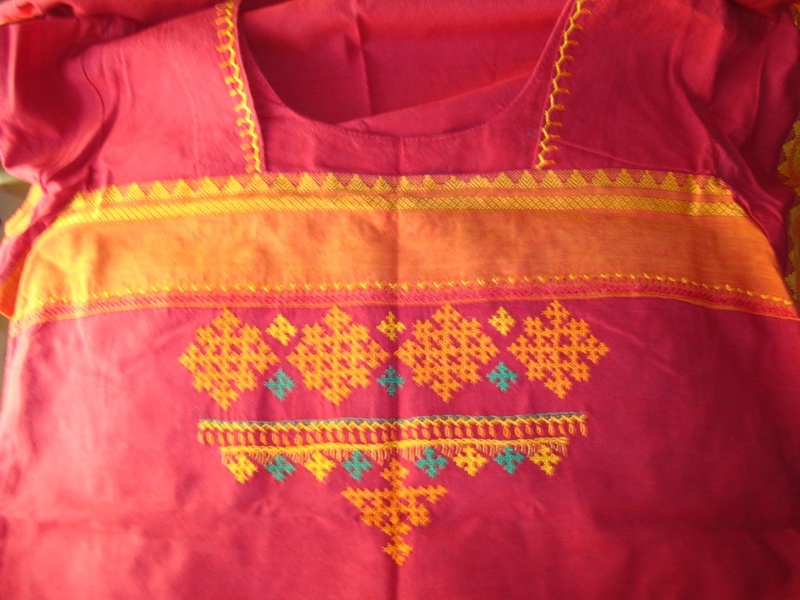 The pattern for this kutchwork embroidery was drawn with this neck design. It was transferred on to the marked fabric. 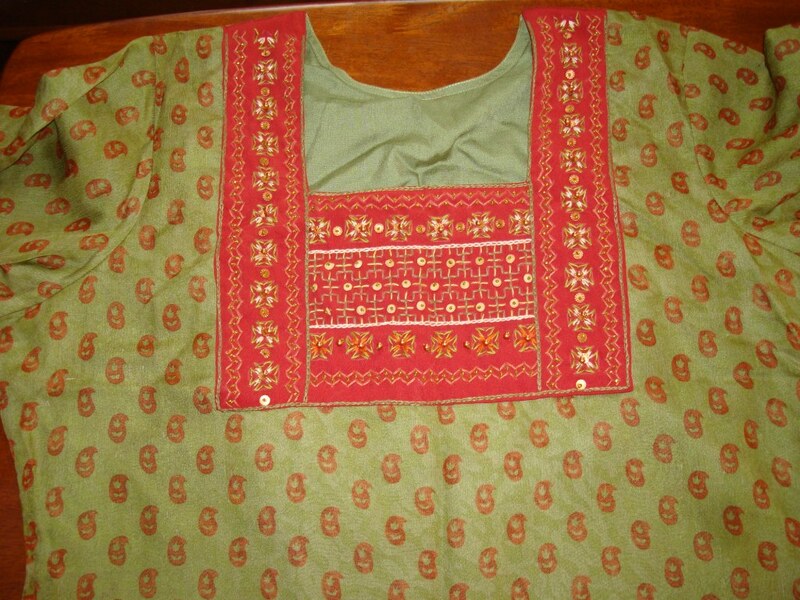 This tunic sample is a proof of a good coordination of pattern neckline and the tunic neckline. 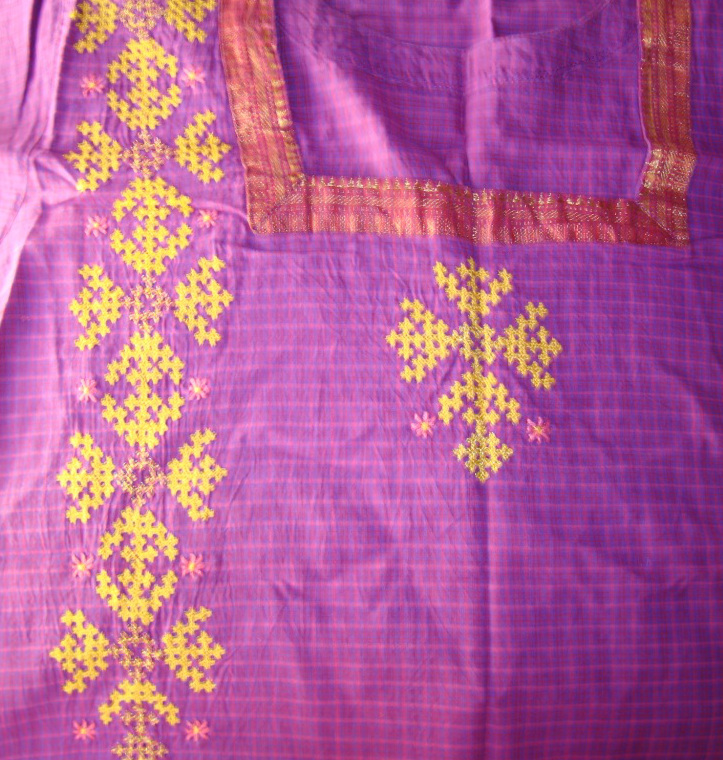 The embroidery design for this cotton mangalagiri tunic was picked from a salwar design magazine. The tailor had this magazine with him. When I wanted to do this project, he not only marked but also explained where each and every element should be placed. Based on the inspiration and the guidance, this pattern was drawn and embroidered. Around the neck I had to draw the elements by hand to get the same effect. Still it was worth it. This embroidery has surface satin stitch on it. 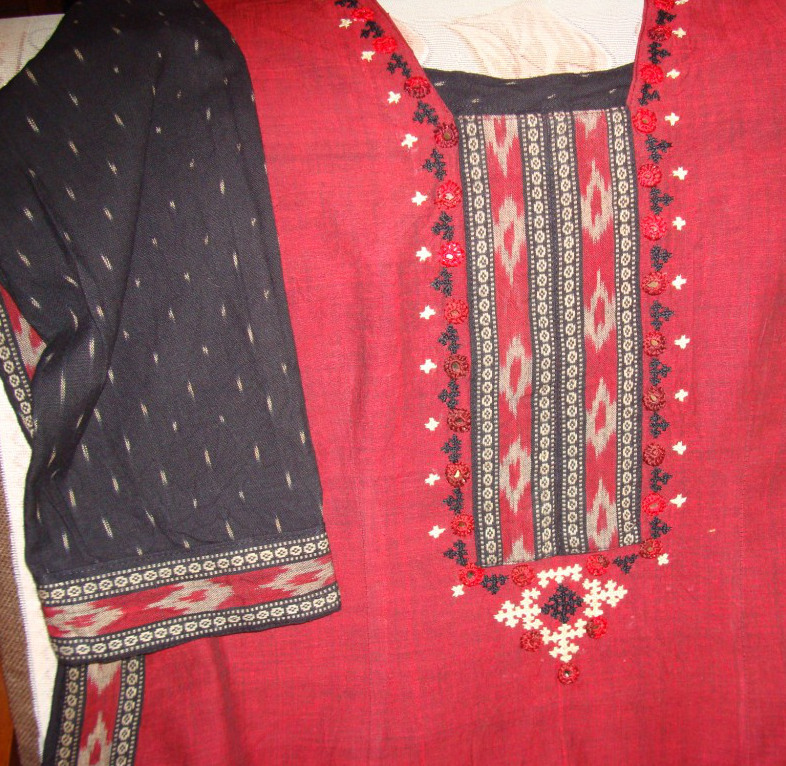 Each and every design on these samples was chosen for that particular tunic in mind and they were all worked with the help of the markings made by the tailor. 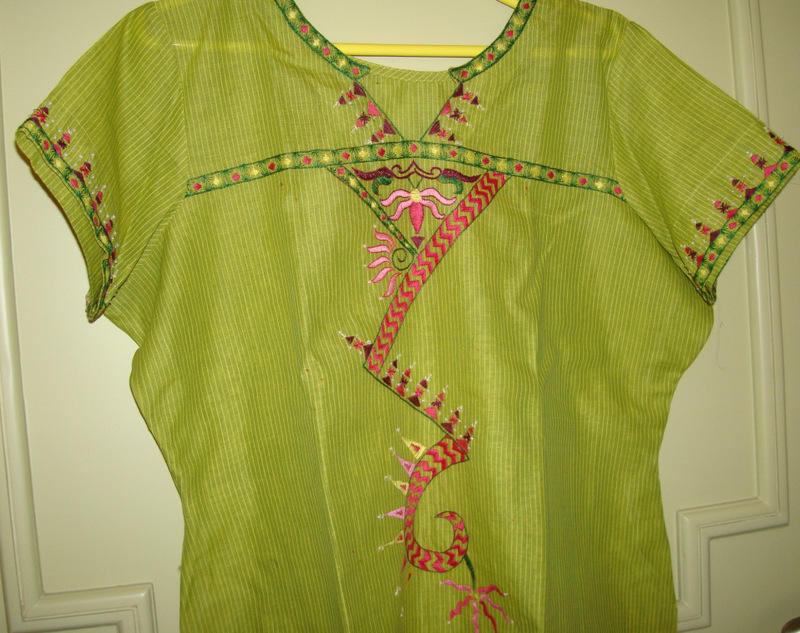 We can work any embroidery on the tunic fabric in this manner. 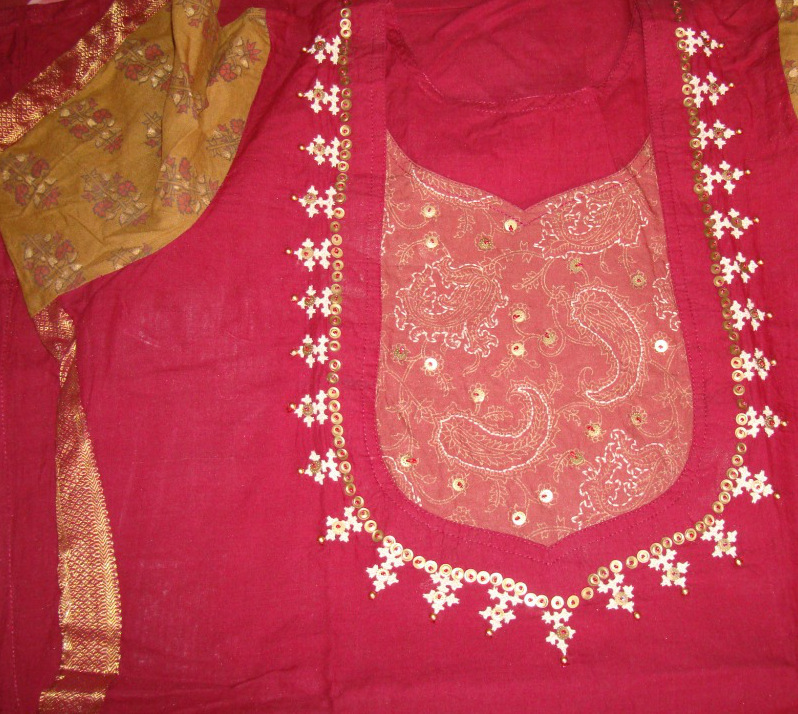 Important thing to note is to check whether the fabric is suitable for that embroidery. 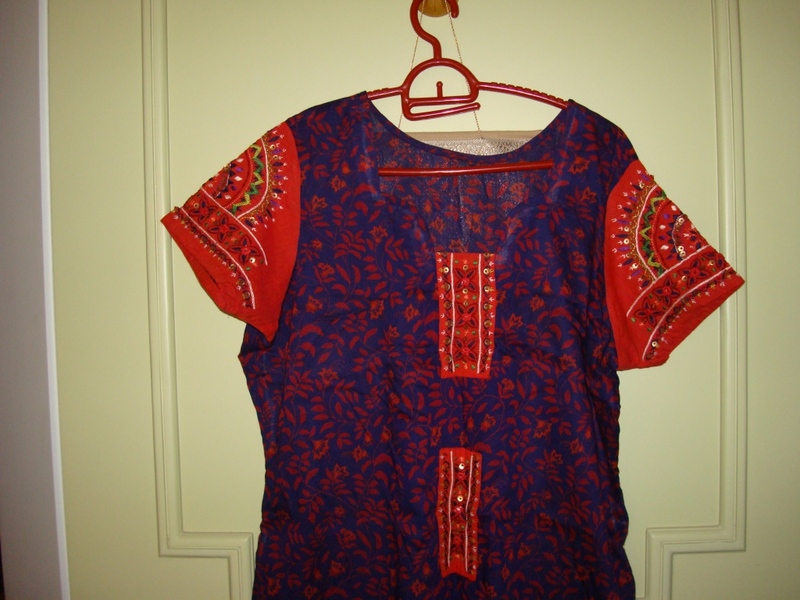 It is not just designing the embroidery, the tunic style is also kept in mind. It is a very interesting work. 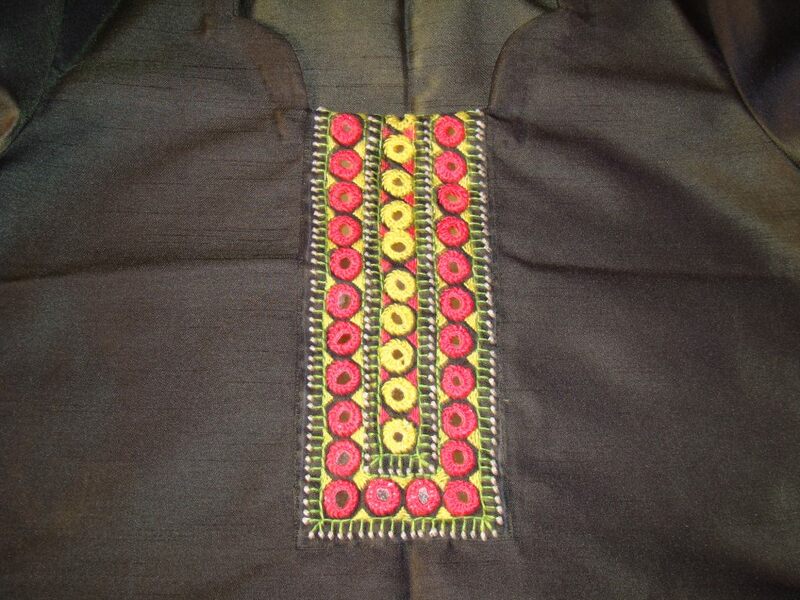 Practice, perseverance, eye for colours, basic calculations and understanding of fabrics and embroidery are the tools. Enjoy designing and embroidering on wearable.